What do farmers think about when they make decisions about managing their farms? And how do changing conditions influence these decisions? Understanding farmer behavior can help develop more sustainable and resilient farming systems in the face of changes and volatility in climate, consumer demand, and land competition. 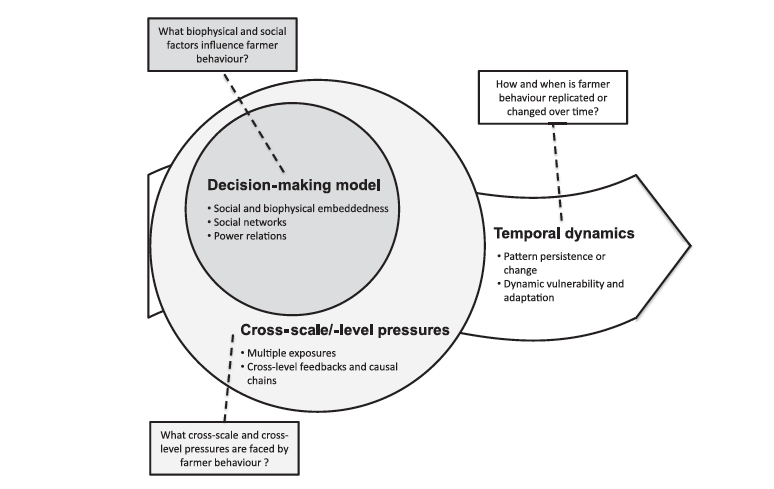 In this study (summarized in this blog post for SIANI), we gathered five diverse case studies to develop a framework for studying farmer decisions to account for the environmental and social context, the interaction of many influences across scales, and how farmers act over time. ​I first became interested in agricultural climate adaptation in my PhD dissertation, for which I interviewed winegrowers and winemakers in Northern California to understand their motivations for management decision-making, and analyzed their vulnerability and adaptive capacity to climate change. We concluded that, while a number of adaptation options exist, grower responses to environmental stresses tended to be individual, reactive, and based on past experience, which presents challenges for adapting to the novel and increased stresses of climate change (Nicholas and Durham, 2012, Global Environmental Change).